The circadian clock of the human being was not designed for sudden time changes. This leads to stress, flared tempers, and lower ability to concentrate on a task. The circadian clock of the human being was also not designed for a wake-up time when it is dark outside. This also leads to the stressful effects listed above. It has now been shown that stress causes obesity. The stresses caused by the time change add to this. Some people take 3 weeks to get over the jet-lag-like symptoms the time change causes. Others who have trouble waking up when it is dark out will have the symptoms over longer periods. People are mad, because government has the power to do this to them. This adds to the stress, and to the obesity. All of the above symptoms reduce worker productivity during the 3 weeks following the time change. This hurts business more than being in sync with other localities helps it. The time change causes auto accidents by changing lighting conditions, in addition to the added stress on the drivers from the circadian clock change. This is a real cost, which raises insurance rates. The time change causes extra costs and schedule adjustments for factories, airlines, railroads, bus companies, traffic signal systems, and automated processes. In the case of transportation systems, often the conveyance is not available when the next scheduled run should start because it is still an hour away. This also plays havoc with required break times for drivers. Some shift workers find themselves with short shifts and/or reductions in pay the week of the time change. It is impossible to program a VCR or DVD-R recorder to correctly record a show that spans the time change. Most VCRs can't do it right even if they are programmed correctly. Most record only part(s) of the program. And don't forget that in 2007 and later, older recorders will change time on the wrong date. They NEVER get the published TV schedule guides right the week of the time change. Networks originating in different time zones change time at different hours. And at least one network is shown without a time change when it has one, or with a time change when it does not have one. This last error lasts the entire week of the booklet, and often into the following weeks. Even screwier is that many of the TV schedule guides put in the hour that the time change takes away in the spring, and actually assigns TV programming to that nonexistent hour. Then in the fall, they don't show you the second 2 AM hour, so you don't know what's on then. The newspaper here "solved" that problem by never listing any programming after 12:30 AM. Changing time is a nuisance. Some watches require an expensive trip to the jeweler to make the change. When you spring forward, it breaks the clock spring, which then falls back out of the clock and onto the floor. You can't put the spring back in the clock, or the clock will fall forward and then off the wall. So Daylight-Saving Time won't save you anything, because you need to spring for a new clock. One Arctic country changes time by 2 hours when it changes. No other country stays in sync with that country. World trade is confounded by the change, because some areas shift as much as 3 hours in relation to other areas. World trade is confounded because different countries change time on different dates. Any time change in the Southern Hemisphere turns the clocks in the opposite direction to the time change in the Northern Hemisphere, because the seasons are 6 months out of phase. If each country changes by 1 hour, they move by a total 2 hours, compared to the time relationship they had before the time changed. Torrid Zone countries have absolutely no reason to change time, because the sun never changes its timing much there. So other countries shift an hour in relation to Torrid Zone countries. Congress passed a law that moved the date Daylight-Saving Time starts from the first Sunday in April to the second Sunday in March, and moved the ending date from the last Sunday in October to the first Sunday in November, starting in 2007. This has removed any time links we now have with some other countries in the Northern Hemisphere that do change time. Home air conditioner: Today, most houses have air conditioning. 56 percent of the homes in the US have central air, and many other houses have window units. So if the clocks are set an hour ahead of the sun, it wastes energy instead of saving it. People come home from work an hour earlier, and turn up their home air conditioners an hour earlier, in the hottest part of the day. This outspends any saving gained from the reduced use of lights. Turning the clocks an hour ahead of the sun reduces the energy saved by automatic setback thermostat systems on air conditioners, because they increase the power usage an hour earlier every day, during the heat of the day, usually with no offsetting power usage decrease in the morning. The increased home energy use due to air conditioning, with the clocks an hour ahead of the sun, also outweighs any energy businesses save on air conditioning. This is because there are many more homes than businesses, and (taken collectively) they contain a much larger volume of air to be cooled. Car air conditioner: Now that most cars have air conditioning, turning the clocks an hour ahead of the sun, wastes energy instead of saving it. People come home from work an hour earlier, and turn on their car air conditioners an hour earlier, in the hottest part of the day. They also turn on the air on days they would not have used the air if the clocks were not advanced. This should cost the average consumer about $30 to $100 more a year, depending on the amount of commuting done in hot weather. Car defrosters: Since all cars have defrosters, if the clocks are set an hour ahead of the sun, it also wastes energy in cold months, instead of saving it. People come out an hour earlier on cold days and find frost or ice on their car windows. So they start the engine, turn on the defrosters, and start scraping ice by hand. If the clocks were not advanced, the sun would have time to melt the ice loose on most days before time to go to work comes around. Often running the car defroster also runs the car air conditioner, to remove moisture from the inside surfaces of the windows. This uses even more gasoline. With the clocks advanced, there is not enough time for a feature film between dusk and curfew. This killed off the drive-in theater by taking away the teenaged clientele. With the clocks advanced, people have to get up before sunrise, often in the dark. This adds to the stresses listed above, because the pineal body arouses the human body when it gets light outside. Children have to go to school in the dark. Amateur astronomers have to stay up later to do any observing. That's 28 different reasons against observing Daylight-Saving Time. Some sadistic government officials get satisfaction from driving people crazy or making them sick. The change dates in 2006 and earlier made the time change the April Fool and Halloween pranks the government played on the rest of us. Too bad that the disadvantages listed above are real costs. Too bad that changed in 2007. People can work on their property after work. Businesses save a little on lighting and air conditioning. That's 6 different reasons for observing Daylight-Saving Time. The argument is clearly against changing the clocks twice a year. Businesses favor the time change, but only because New York changes time. Media people rabidly favor the time change, again because New York does it. Politicians favor the time change - maybe for a fiendish display of power. Most workers hate the time change because of what it does to their bodies. Almost everyone else hates it too. It's time to stop madly changing the time back and forth. Write your congressmen and state legislators. Ask them to end this stressful clock-changing madness. If you own a business, or can work flex time, don't make the time change. Government can't really force you to change your clocks or your business hours. Or set your business hours an hour later when the clocks advance. When people from outside your time zone call, tell them the standard time for the area as the current time. 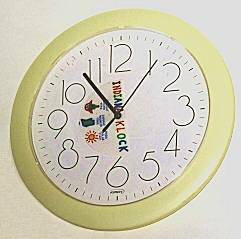 Make a special clock with two hour hands. The hour hands should be fastened together an hour apart from each other. Write "Standard time" on the slow hand, and "Daylight Stupid Time" on the fast hand. Then you never have to reset this clock. In Indiana, the special clock must have three hour hands. The hour hands should be fastened together an hour apart from each other, pointing to three consecutive hours. Write "Standard Solar Time" on the slowest hand, "Indiana Standard time" on the middle hand, and "Daylight Stupid Time" on the fastest hand. Then you never have to reset this clock. Do everything you can to ridicule the time change, and the politicians who demand that you change time (and who obviously do not actually use their brains). Listen to the time station WWV on any short-wave radio. Set the sun hour hand to 6 hours behind the Coordinated Universal Time heard on the radio. For the position of the sun, use the hour hand with the sun on it. For Central Time when Daylight-Stupid Time is not in effect, use the hour hand with the sun on it. For Central Time when Daylight-Stupid Time is in effect, use the hour hand with the Indiana map on it. For Eastern Time when Daylight-Stupid Time is not in effect, use the hour hand with the Indiana map on it. For Eastern Time when Daylight-Stupid Time is in effect, use the hour hand with the clown on it.